Spinning khadi points to a new-age future? Dasna Dihat village, Ghaziabad: In a small courtyard outside the one-room house she shares with her parents and seven siblings, 16-year-old Sahista Khatun spins yarn out of balls of cotton latched to a box-shaped spinning wheel, an upgraded model of the traditonal wooden charkha or spinning wheel. Sometimes, her sister, Rukhsar, who attends a local madrassa, pitches in at the wheel after her afternoon class and, Hazra Saifi, her mother, works at a khadi production unit nearby. In this village, on the edge of Ghaziabad’s untidy urban tangle some 55km from Delhi, spinning khadi is a means for most women to supplement their meagre family incomes. Sahista’s family manages to spin 2.5g a day and adds Rs2,000 a month to the family earnings by supplying yarn to Sushila Gramodyog Sansthan. Now after several decades, spinning a wheel may just get a lot easier if a new improved charkha, powered by solar energy, becomes feasible. Due to the lack of innovation and investment in product development, the khadi industry has barely kept pace with changing trends of consumer taste. And low wages have forced workers to move away from this labour-intensive traditional sector; the workforce has declined from 1,400,000 to 900,000 in the past 10 years. Higher production costs—khadi is 40-60% more expensive than mill cloth at Rs50-60 a metre—also makes the industry unviable. The solar-run charkha aims to reduce “drudgery of women spinners", says R.B. Chavan, in charge of khadi development at the Wardha institute. “The spinner can double her productivity by running several spinning wheels at the same time without using much effort." With sunlight differing in many parts of the country, more trials need to be conducted to fine-tune details, he adds. The institute had filed a provisional patent for the machine. The solar charkha is designed to operate an eight-spindle spinning wheel, popularly known as New Model Charkha and developed in the 1950s—an improved design on the single spindle charkha popularized by Mahatma Gandhi. It can be used during the night depending on the battery storage capacity. While the eight-spindle version is the most popular, charkhas also come in one and six-spindle variants. Khadi, by definition, means a handspun and handwoven fabric under the 1956 Khadi and Village Industries Commission Act. Since the new technology does not use manual labour, the act may have to be modified, says Sharma. For decades, the production of khadi has been synonymous with employment generation. Under Gandhi’s vision of a decentralized economy, spinning and weaving for personal consumption were as much about self-reliance as about making a broader political statement for India’s independence. People who still follow Gandhi’s philosophy say the relavance of charkha has increased in India’s liberalised economic environment where industrialization is taking land and jobs away from people. “We have been seeing a negative employment growth in sectors such as mining and heavy industries due to automation. What we need is a community-scaling of technology to generate more employment," says T. Karunakaran, the Wardha institute’s first director. Several entrepreneurs see an opportunity in the spin-offs that are being developed around the charkha. Last year, R.S. 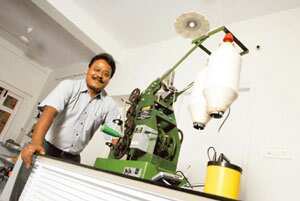 Hiramath, owner of Bangalore-based company Flexitron, received critical praise when he introduced the award-winning e-charkha, or electric charkha, which can produce power by the simple act of turning the wheel. The patented product can run a transistor and light four CFL (compact fluorescent light) bulbs. “It’s really empowerment put in a box. Villages which have no electricity can generate it now by spinning yarn," says Hiramath. And, the product is already generating interest. Andhra Pradesh, for example, plans to distribute 200 pieces to beedi workers this year, primarily to wean them away from their current occupation, which is perceived to be hazardous. Similarly, the government has initiated a programme, which will be financed through a Rs650 crore loan from the Asian Development Bank, to revamp 300 khadi institutions. The money will be spent on marketing and product development, says Ram Das Sharma, a member of the Khadi Village Industries Commission, the body that governs the sector. Currently, khadi accounts for 0.3% of India’s $52 billion textile industry. Last year (2007-08), the industry recorded a turnover of Rs555 crore. “We expect to double this target during the 11th Plan and plan to increase number of institutions and workers," said Das Sharma. The real challenge, however, will be to make a new improved khadi popular with consumers and to encourage khadi workers, who mostly turn to weaving and spinning out of necessity rather than choice, to continue turning the wheel. Optimistis say khadi’s inherent uniqueness—a handcrafted product using natural fibre and dye—will eventually prove a winner. “Khadi is not just about weaving cloth. It’s about giving employment." says Sathish Kumar, a product manager at Ghaziabad’s Sushila Gramodyog. “And, if people are ready to buy brands, such as, Color Plus and Allen Solly, they will be ready to pay higher prices for khadi." Others, however, are less sanguine and believe that more radical, but politically more difficult, change is required if khadi has to survive. “We have a romantic notion of khadi. Part of the problem is that we have a subsidy-based approach and a bureaucratic structure where politicians have to be accommodated," says Jairam Ramesh, minister of state for commerce. Calling for a change, adds Ramesh, would be almost like “knocking the Gandhian legacy."